Blue Lagoon Village is a luxury village-style complex that offers all-inclusive stay, near the picturesque Paradise Beach in Kos. Located 7 km away from the airport and 10 km from the nearest town Kefalos, the family-friendly hotel is one of the prominent beachfront properties in the area. It has 366 well-furnished guestrooms built amid mesmerizing scenery, excellent sea views and in walking distance to the beach. The hotel boasts a number of attractions that include a 3000 sq m pool with Jacuzzi and water jets, children’s pool, a host of specialty restaurants and bars, health club, spa, Adventure Land fun park and thrilling water sports on the beach. 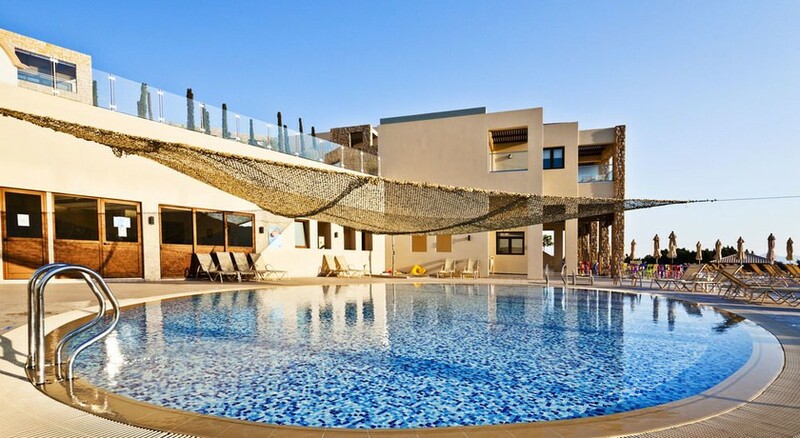 with warm hospitality and luxurious amenities, Blue Lagoon Village offers its guests a comfortable stay at the amazing beach destination of Kos. Blue Lagoon Village is located amid the picturesque landscape and the powder-soft Paradise Beach of Kos. 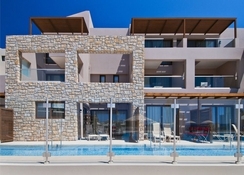 It lies 10 km from the centre of Kefalos and 30 km from the Kos town. The airport is 7 km from Blue Lagoon Village. The hotel has 366 guestrooms spread over a village-style compound and come in a number of categories such as standard rooms, family rooms, junior suites and executive deluxe suites. The standard rooms offer garden or sea view, and some of them come with swim-up pool and terrace. The Junior suites and Executive suites feature private pools. All the rooms are well furnished with en-suite baths, balconies, satellite TV, telephone, safe, mini-fridge, tea/coffee making facilities and air-conditioning. Blue Lagoon Village has 7 restaurants and 8 bars/lounges. 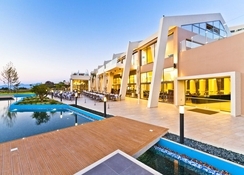 The Aegean Main restaurant comes with amazing sea views and serves buffet breakfast and dinner. Other restaurants at the hotel offering a variety of cuisines include Susshimi restaurant (sushi and Asian cuisine), Thalassa Fish Tavern (fish and traditional Greek dishes), Golden Sun (Chinese delicacies), Mythos Taverna (authentic Greek dishes) and Piazza (Italian cuisine). Green & Grill is a meat grill while the Gelateria is where waffles, desserts and ice-cream can be savoured. The bars and lounges – including pool bar, beach bar, cocktail bar and executive lounge – are located throughout the hotel complex and each of them feature a different theme and decor. Blue Lagoon Village has several opportunities for recreation and relaxation of guests. Facilities include a heated pool, Jacuzzi, sauna and steam bath. The long, sandy beach has various options for water sports and beach gazebos are available for a charge. Besides the grand 3000 sq m pool that comes with Jacuzzi and water jet, there’s a 1000 sq m activity pool, a children’s splash pool, a 1000 sq meters leisure pool and a relax pool. The Armonia Spa is a good choice for relaxation and rejuvenation. There’s also a shopping mall with boutique shops, health club, mini football ground, tennis court, basketball/volleyball court and a range of water sports available. 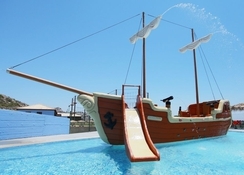 For the young guests, the hotel houses a fun park Adventure Land that offers waterslides for adults and children. There are also daytime entertainment programmes for adults and children, shows and live music sessions.